After years of talking about it we finally booked it. Three nights in the Icelandic capital, Reykjavik. With so much to do there we had to narrow down our options to pack in what we could in 2 ½ days as there is a lot to see and do in the area. Arriving at the airport we take the flybus to the BSI bus station close to the town centre (but not that close, from there you can change to a smaller bus and get dropped nearer your accommodation – perhaps don’t walk it like we did!) and head to our hotel the Leifur Erikkson, directly opposite the striking Hallgrimkirkja church – the most recognisable landmark in Reykjavik. We head out immediately having booked on to the popular Reykjavik food walk a food tour of the city and a great way of scoping out some good places to eat and drink during your stay (we returned to a few of them) and orientating yourself – a good thing to do when you first arrive. After eating lots of very tasty traditional Icelandic food (think fish and lamb – while there are vegetarian options, vegans may want to give it a miss), we head back to the hotel to start getting ready for our northern lights tour. As we travelled in mid-September we were picked up from the nearest bus stop to our hotel at 9.30pm. If you go during winter, there are tours that start earlier. Wrap up as warm as possible as it is freeeeezing in Iceland at night, long thermals are a must. Wear all your clothes if need be. We were taken in a coach to an area near the airport where we waited for an hour and a half (you can of course sit on the coach to keep warm) for the lights to appear. Unfortunately, they were a no show. It happens. If this is the case the company will let you book on a tour another night during your stay free of charge, so make sure and book your tour for early in your stay. Tip: The best time to see the aurora borealis is between mid September and mid April, when the sky is dark enough at night. We took the morning to explore the town (the word city is a stretch, even if it is the capital). Even on a bright, breezy September day wear your thermals as the wind chill can be brutal. 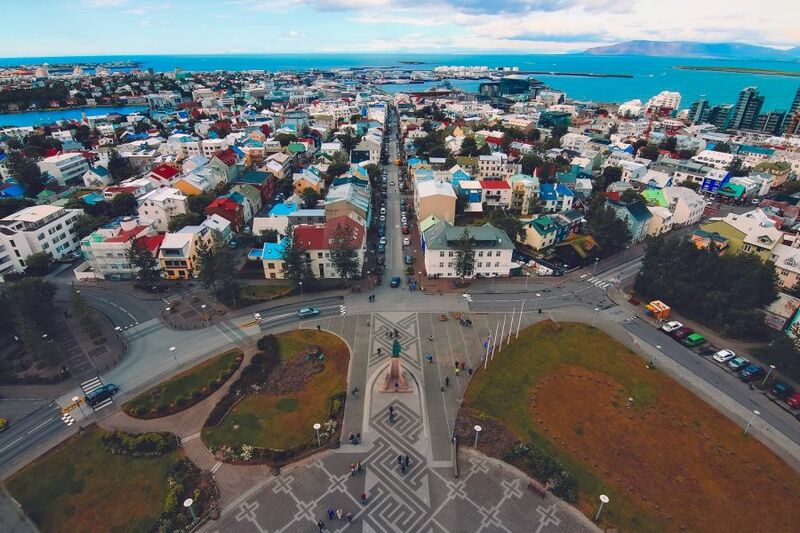 The best way to see Reykjavik is on foot, we started by visiting the Hallgrimkirkja church and heading up in the lift for some great views of the city. Then we headed further downtown, where you can wander past the prime minister’s office and the parliament, which are not grand imposing buildings but fit in with the eclectic mix of architectural styles around Reykjavik, using materials from corrugated iron, to stone and concrete. The Harpa concert hall is arguably the most striking building downtown, entirely covered in glass panels that reflect the sky and seafront. After a bite to eat in a downtown café, we head towards the harbour where we had booked on a classic whale watching tour. You can choose to sit below deck or don these fetching overalls for sitting on deck. As with the northern lights we didn’t see the whales ourselves, though others apparently caught a glimpse of some Minke whales at the front of the boat (as the captain is following them, perhaps you have more chance of success by positioning yourself at the front of the boat). As with the northern lights tour if you don’t see any whales then you can claim a complimentary ticket to go again in the next two years. As the sea can be rough you might like to take advantage of the free seasickness pills on offer! After we get back on dry land we head back into the city to sample some of the local beverages (stopping off at one of the places on the food walk no less). Icelandic beer is served ice cold – my personal favourite was Einstock white ale (have you been? If so which was your favourite, namecheck it in the comments below). There are lots of great small breweries in Iceland, all the more surprising as beer was illegal there until 1989. 1 – The currency is Icelandic Kroner – but don’t withdraw cash for a short stay, pay by card everywhere to avoid having cash left over at the end of your stay. 2 – Iceland is an expensive country, especially when it comes to eating and drinking out. Try downloading the Appy hour app on itunes or android to find when each bar offers happy hour drinks. 3 – If it’s a cold day head to one of the museums like the Saga museum which tells you all about the Viking settlers, the Perlan to learn about the country’s unusual geology, Tales from Iceland a video/photo exhibition about the history of the country, the Árbær Open Air Museum to find out more about pre-industrial ways of life, Whales of Iceland (probably included with your whale watching tour), or the Phallological museum, where you can find some, ahem, unusual souvenirs. If you plan to visit a few then purchase a city card for free admission. 4 – If you can’t manage a trip to the world famous Blue Lagoon, then do what the locals do and head to one of the swimming pools around Reykjavik (also included on the city card). Most are outdoors and open all year round for a relaxing spa-like experience. The pools are thermally heated to about 28°C and there are usually several hot tubs to choose from, at temperatures ranging from 38°C to 45°C. Most thermal baths have steam rooms, and some also have saunas and plunge pools to cool down. Continue to part 2 – the Golden Circle and Silfra!